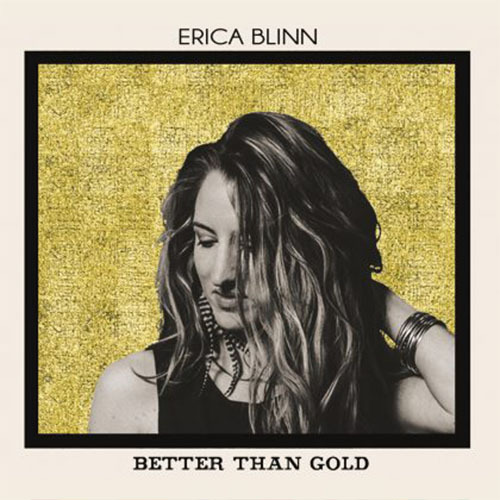 Singer, songwriter, guitarist, and harmonica player Erica Blinn releases her second full length album, Better Than Gold. Blinn continues to present music that is Country and Americana, while still being based in the blues. Her collection of eleven songs displays Blinn’s boundless songwriting, outstanding band, and her rich voice. Blinn has a special way of writing a song that has a hook in it that will grab your attention and pull you in any direction her heart desires. The independent rocker has a Nashville approach to her songwriting, keep it honest, keep it about real life and write great melodies and then, sing your heart out with a kickin’ band. Blinn clearly has this formula down! That’s the short of it! Better Than Gold is produced by Mike Landolt, so the album is engaging and brings Blinn’s voice right up front and personal, yet, downright intimate, and that’s a good than’. Blinn’s lyrics are filled with depth and brimming with excellent melodies. Not to mention positive vibes. Her guitar skills and harmonic playing keeps it interesting, while still sticking to the core of hummable melodies that linger. Erica Blinn blurs the rock, blues and Americana lines to bring us, Better Than Gold. Strong songwriting and memorable melodies only seem like words when describing Blinn gifts. Her voice will charm you, her guitar playing will disarm you, as she takes you for a good ole, American music ride.